The moth Lirimiris truncata is a member of the mostly tropical Prominent Moth Family (Notodontidae), and here in the United States, these moths are found only in the southernmost part of Arizona. I observed this colorful Lirimiris truncata caterpillar in Agua Caliente Canyon in the Santa Rita Mountains. Lirimiris truncata caterpillars are bright yellow and tiger-striped with black and white, and they have a few patches of white bristles, a red head, and an even larger red tail hump. This large tail hump might function as a false head meant to divert predators' attacks away from the more vulnerable actual head. 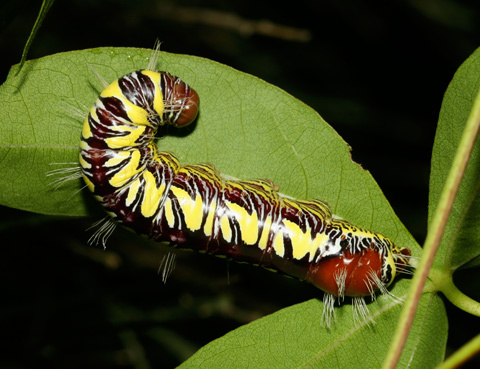 The garish coloration of Lirimiris truncata caterpillars makes them highly visible to birds and other predators, but these caterpillars' bold yellow, red, and black colors are actually a universally recognized type of aposematic (warning) coloration meant to warn away potential predators. I don't know if these caterpillars are actually poisonous or noxious, but many caterpillars in the same family have chemical defenses and can spray foul-smelling, irritating, or toxic fluids if disturbed. Noting this caterpillar's bright warning colors, I didn't try handling it. Lirimiris truncata caterpillars feed on the leaves of Thurber's Cotton (Gossypium thurberi), and if you wish to see these unusual caterpillars, look for them on these plants in August and September. Unlike their colorful caterpillars, adult Lirimiris truncata moths are quite drably colored. The adults have a large, plump, brown body, grayish brown hindwings, and dark brown forewings with a broad, cream-colored band along the leading edge. The adult moths are nocturnal and can be seen around lights at night from late summer through mid-fall.